After battling congestive heart failure (CHF) for many years, Morris* felt like it was time to consider hospice care. The illness had progressed to an advanced stage, causing frequent bouts of pain, exhaustion, and shortness of breath. These downturns often led to hospital visits and prevented Morris from enjoying his life. Plus, the 70-year-old was growing more anxious, never knowing when another health crisis was coming. When a friend suggested hospice care, Morris bristled at first. He wasn’t ready to die! But then he decided to get the facts. Morris did some research online about congestive heart failure and hospice, and learned that hospice could help him feel better and stay out of the hospital. It could reduce his symptoms, enabling him to enjoy the people and activities most important to him. “Why not give it a try?” thought Morris. According to the Centers for Disease Control & Prevention, more than 5.7 million adults have heart failure. Heart failure occurs when your heart does not pump enough blood to your body. The blood that should be pumped out of your heart can back up and cause swelling and fluid in your legs, abdomen, and even your lungs. When you have fluid in your lungs caused by heart failure, it is called congestive heart failure. Heart failure is more common in older people, but anyone can develop this progressive, chronic condition. Heart failure is caused by anything that weakens or damages the heart, such as high blood pressure, diabetes, a prior heart attack, and heart valve disease. Risk factors for developing heart failure include obesity, chronic kidney disease, alcohol abuse, and smoking. In most cases, heart failure in adults can’t be cured. However, treatment can lessen the symptoms. For example, certain medications can reduce extra fluid by increasing urination. A low-salt diet may also help the body rid itself of excess fluid. And other drugs can make it easier for the heart to pump or help the heart contract with more force. 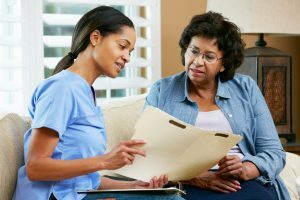 What are the hospice eligibility requirements for CHF? Learn more details. Like Morris, people with heart failure need to make important decisions for when they’re in the advanced or “end” stages of the disease. They need to think about the type of care they want, with questions like: Do I want to receive aggressive treatment? Is quality of life more important than living as long as possible? Do I want to keep going to the hospital or can this be managed at home? For advanced heart failure patients, making good decisions requires teamwork. Your doctor and/or your hospice team can help you make these important choices. 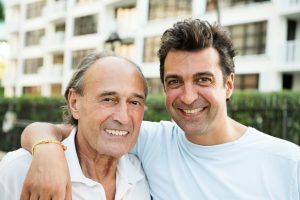 Patients should have these conversations “early and often,” according to the American Heart Association. They should discuss treatment options, the risks and benefits of each option, and possible future scenarios. Hospice is a type of care that focuses on comfort, rather than a cure. It helps patients and their families address the complex issues related to serious illness — including medical, emotional, psychological, social and spiritual needs. Hospice can be provided in a patient’s home or a care facility. In fact, hospice can help the patient remain at home – which most people prefer — by supporting and educating family caregivers to provide care. Hospice takes a team approach, providing specialized care by experts in palliative (comfort) care. The team includes registered nurses, physicians, home health aides, social workers, spiritual support counselors, massage or music therapists, and trained volunteers. Your attending physician can also be part of this team, if he or she remains involved in your care. Hospice care team members help end-stage congestive heart failure patients manage their physical needs and symptoms, as well as their anxiety and emotional needs. Hospice also supports the family in its caregiving, and provides medical supplies related to the heart failure diagnosis. In the late stages of heart failure, hospice workers help patients and families cope with end-of-life issues and grief-related needs. In Morris’s case, his hospice physician adjusted his medications to give him more consistent relief from his heart failure symptoms. A nurse began coming to his home regularly to monitor his condition, support his health, and address any new issues. And a home health aide started visiting several times each week to help Morris with bathing and grooming so he felt and looked better, which lifted his spirits. These visits also provided added company for Morris, and a helping hand with light household chores. Plus, Morris was able to avoid the frequent hospitalizations he’d experienced prior to hospice care. Again, one need not meet all of these criteria in order to receive hospice care. If you have questions, Samaritan is available to help. Call our Referral Center at (800) 229-8183 to discuss a person’s specific needs or to arrange for an assessment visit. Samaritan serves residents of five counties in Southern New Jersey: Burlington, Camden, Gloucester, Mercer, and Atlantic. Hospice care can be provided anywhere the patient resides – at home, in an assisted living facility or nursing home — or as an inpatient in a hospital or dedicated hospice center. Inpatient hospice care is used for patients whose pain or other symptoms are too severe to be managed in their usual residence, and the person needs close monitoring by a nurse around-the-clock. 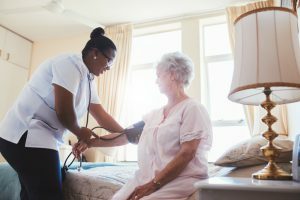 Inpatient hospice care can be provided in a standard hospital room, in a dedicated hospice unit within a hospital, in a contracted skilled nursing facility or in a freestanding hospice center. Hospice is covered by Medicare, Medicaid, and most health insurance companies. This coverage includes medications related to the primary hospice diagnosis (for example, congestive heart failure). It also covers all equipment and supplies needed to care for the patient, related to the disease. Medicare Part A and Medicaid cover 100 percent of hospice care. With private insurance companies, payment levels vary depending on the patient’s insurance policy. An annual heart failure review to discuss how well you are functioning, treatment goals, and your preferences for treating possible emergencies, such as kidney failure or sudden cardiac arrest. “Milestone” discussions to reassess treatment goals following a major event, such as a defibrillator shock, hospitalization, or significant loss of function. Honest and thorough conversations about major side effects of treatment, quality of life, loss of independence, impact of worsening symptoms, and increased commitment by caregivers and families. 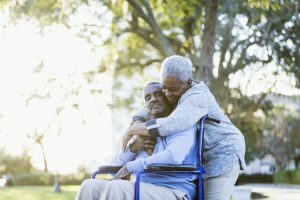 Considering palliative (comfort) care before you transition to hospice care. Palliative care can be offered alongside medical treatment at any stage of illness to help manage symptoms and assist patients and families with tough decisions. Developing a care plan for the end of life that ensures your needs and wishes are met. Hospice provides palliative (comfort) care for end-stage heart failure patients, as well as end-of-life care and support for patients and their loved ones. With advanced planning, patients and families can avoid the stress of making difficult decisions during a crisis, and help ensure your needs and wishes are best met. • Medical care, including regular visits by a nurse and other team members, and oversight by a palliative/hospice physician. • Medications and medical equipment related to your CHF and any other related conditions to reduce symptoms and pain. • Medical supplies, from supplemental oxygen to wound dressings to incontinence products. • Education and support for caregivers, to help them care for the patient safely and effectively. • Counseling about the emotional and spiritual impact of heart failure and the end of life. • Respite care to give breaks to caregivers. • 24/7 access to the on-call team, enhancing families’ peace of mind. • Grief support for the family. The goal of hospice is not to cure a disease, but to control its effects. The benefit of hospice care is that it facilitates the best possible quality of life, as defined by you and your and family. • Strong history of serving congestive heart failure patients and their families. • Year the agency opened; at least 20 years of experience is preferable. • Hospice-certified nurses and doctors on staff and available around-the-clock. • A 24/7 call line. • Specialized services to improve the patient’s comfort, such as massage and music therapy. • Medicare certification. This requires the hospice to follow Medicare regulations, and is necessary to receive Medicare or Medicaid coverage of hospice services. Hospice care services help families best care for a loved one with end-stage heart failure. If you or a loved one has heart failure or another life-limiting illness, please contact Samaritan to learn how we can help. Reach us 24/7 at (800) 229-8183, or by contacting us here. Need to know what the requirements are for hospice on CHF? Click here. *Morris is a fictional character based on actual experiences of real hospice patients with congestive heart failure.